Dynamic Digital Advertising knows that not every potential consumer can be reached with traditional broadcast forms of advertising. Bringing in new business in often takes an unusualapproach and transit advertising can be a good way of reaching an untapped audience. 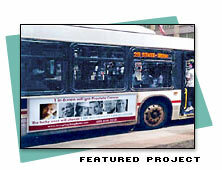 Transit advertising can be found on buses, trucks and commercial vehicles. With the right blend of eye-catching graphics and text, the brief moments commuters have to absorb this form of advertising can be highly impactful. Bus signs, truck signs and other forms of transit advertising are large format graphics meant to deliver messages quickly. DDA can strategically place your transit advertising on high-traffic routes for greatest visibility. Marketing plans built around careful research of your company's target customer will help yield the best results for your transit advertising dollar. Dynamic Digital Advertising has the expert skills in design and production needed to create large format graphics for all your outdoor advertising needs. Bus signs and transit signs are just one facet of DDA's wide variety of digital advertising services. From concept to completion, Dynamic Digital Advertising can be relied on to get your project done right.